Preheat oven to 350ºF. Line a jelly roll pan with non-stick tin foil or parchment paper sprayed with non-stick cooking spray. Prepare one cake mix according to instructions. Stir in green food colouring. Spread green cake mix into jelly roll pan. Bake cake for 18-22 minutes. Allow to cool for 10 minutes, then freeze for one hour. Spray 2 extra deep (3-4 inch tall) 8-inch round cake pans with non-stick cooking spray with flour. Line bottom of pans with non-stick tin foil or parchment paper. Prepare remaining white cake mix. Spread 1 cup batter in each of the round pans. Remove green cake from freezer and cut 40 shamrocks using a 1-inch cutter. (You will have extra cake.) Arrange shamrocks upside down (stem facing up) in a circle about an inch from the edge of the round pans. You'll use 19-20 shamrocks in each pan. Pour 1 cup of batter over shamrocks, completely covering them. Equally divide remaining batter and pour it into the centre of each cake pan. Bake at 325ºF for 30-34 minutes, until a toothpick inserted into the cake centre comes out clean. Allow cakes to cool completely. Level cakes using a serrated knife. Flip one cake over and set on an 8-inch cake round. Spread frosting over top, and flip second cake over and place on top. Frost top and sides of cake, using a crumb coat first, then a final thick layer of frosting. Smooth frosting well. Cover cake with green fondant. Knead remaining green fondant, roll it out, set it on a cake plate then cut it into a 10-11 inch circle, removing excess. This will be the hat brim. Set cake in the centre of the fondant hat brim. Roll and cut a 24-inch long by 1-inch wide strip of black fondant. Wrap strip around the base of the cake, forming the hat band. Roll out and cut out a white or yellow fondant buckle. If using, spray buckle with gold food colouring spray. After the buckle dries, brush the back with some water and attach it to the black hat band. 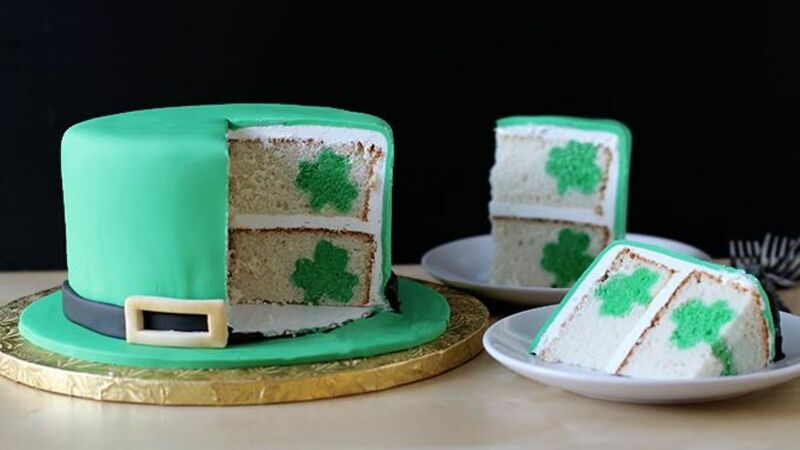 Cut cake into wedges when ready to serve, revealing the shamrocks hidden inside.